Shirley Mae LeBay, 81, of Fostoria, passed away on Wednesday, October 17, 2018 at Blanchard Valley Hospital, in Findlay. She was born on September 15, 1937, in Hoytville, Ohio, to Virgil and Selma (Lazenby) Foltz. She married Floyd LeBay on May 10, 1957, and he preceded her in death in 1996. Shirley is survived by a daughter, Julie (Mike) Haney, of Fostoria; four grandchildren, Eric LeBay, Sean (Monica) LeBay, Lisa (Grant) Johnson, and Andrew Haney; and 12 great-grandchildren and two great-great-grandchildren. She was also preceded in death by her parents, a son, Dan LeBay, and a grandson, Jason LeBay. Shirley was a 1955 McComb High School graduate. 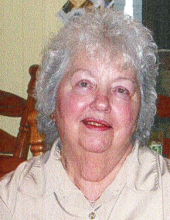 She attended New Hope Christian Church in Wayne, and was a lifetime member of the Northwest Ohio Antique Machinery Association. She was also a huge Ohio State Buckeye fan. A very kind, and sweet lady, Shirley found the most enjoyment in life being with her children, grandchildren and great-grandchildren. Visitation will be held from 10 am -1 pm on Monday, October 22, 2018, at MANN-HARE-HOENING Funeral Home, 407 N. Countyline St., Fostoria. Funeral services will begin in the funeral home following visitation at 1 pm, Pastor Ron Merrit officiating. Committal services and burial will follow in Fountain Cemetery, Fostoria. Memorial contributions may be considered to the LeBay family c/o the funeral home, or to the American Kidney Fund. To send flowers or a remembrance gift to the family of Shirley Mae LeBay, please visit our Tribute Store. "Email Address" would like to share the life celebration of Shirley Mae LeBay. Click on the "link" to go to share a favorite memory or leave a condolence message for the family.